I'm pretty sure I'm done with my art fair coverage over at the ArtCal Zine, so run over there and read all of my posts. Here is some entertainment while I'm blogging elsewhere. The last one reminds me of James and me at plays with badly-behaving audiences. The late Ileana Sonnabend had a great eye, but no estate can outrun the taxman, and now her art collection is being readied to go on the block to allow her executors to pay taxes on her $400 million estate. During the art fair madness this week, James will be writing on his own blog, but I will be one of the people posting to the special ArtCal Zine coverage. The image above is of Dan Levenson, who as Little Switzerland is the only gallery at Disarmory, one of the interesting alternative events going on. From the Gallery to the Street? Hrag Vartanian spots a work on the street he once saw in a gallery. I was reading this otherwise pretty good article on a young activist in today's City Section of the New York Times today when one thing leapt out at me. Despite his attitude toward violent protest, Mr. Kelly has not shied away from dramatic tactics. He has been arrested twice, once two years ago during a protest on Paces Manhattan campus, and once a year ago when he and about 20 other S.D.S. members were detained for occupying an Army-Navy recruiting center in Lower Manhattan. Neither arrest led to any charges. Is this writer implying that getting arrested in non-violent protests is somehow a moral equivalent of using a bomb or other violence to make the same point? I find that a rather dangerous position. I haven't seen this kind of coverage from US media. ... to a smaller space will be this one night art exhibition / dance party curated by Nicholas Weist. Saturday, March 22: one night only! 8-11PM. Featuring Amanda Riner, Billy Miller, Colby Bird, Dave McDermott, David Gilbert, David Benjamin Sherry, Dike Blair, Eric Huebsch, Jacques Louis Vidal, Jeff Tranchell, Jonah Groeneboer, Jonathan Hartshorn, Josh Tonsfeldt, Joshua Smith, Julia Weist, Kate Levant, Lorenzo de Los Angeles, Mara Sprafkin, Matthew Robert Lutz-Kinoy, Michael Magnan, Michael Smith, Nolan Simon, Scott Hug, Tatiana Kronberg, and Timothy Hull. If I told you you were beautiful, would you date me on the regular? is a one-night-only group show featuring artists who have used media and its by-products to make objects. 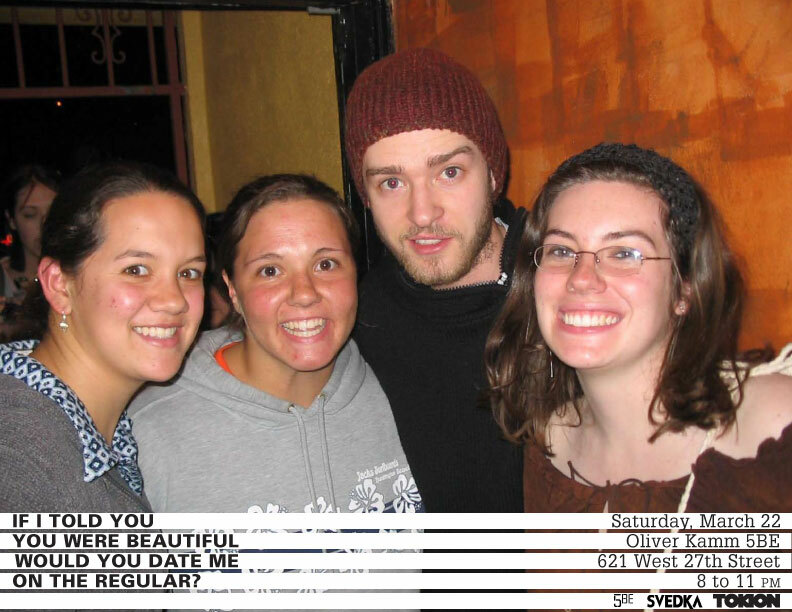 The title is a quote from Justin Timberlake's My Love, a song that asks how little Timberlake would have to do for you to devote yourself to him utterly. 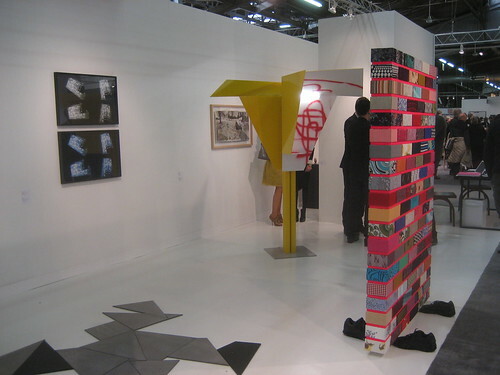 Artists included in the show invert this relationship, demanding culture yield its materials to them for reinvention or repurposing. My latest gallery client, Keith Talent Gallery in London, has moved to a new location, and launched their new website powered by ArtCat. This is a VernissageTV video of a performance by Rachel Mason at Kunsthalle Zürich, Switzerland. In this clip she performes "Dzhokhar Dudayev (Chechen Wolfes)". Visit the VernissageTV website for more information and more video. Here is my quick video of Flora Wiegmann's performance during the preview of the Whitney Biennial as part of the "Animal Estates" project of Fritz Haeg. Click the screen icon on the lower right for a bigger version. She's a wood duck! Visit this New York Times article for more information on the artist. Good stuff. Check out his blog and flickr stream for more. The Playgoer - "Subsidiary Rights"
Did you know the contract Roundabout Theatre Company offers for new plays it premieres claims 40% of all the play's subsequent "subsidiary rights" for 10 years? I got an email about this over the weekend. Check out B. Blagojević's post on the ArtCal Zine and NEWSgrist for more information. Today is the last day for the Kim Jones exhibition at Pierogi. I recommend a visit if you can fit it in today, as the painted photographs in the back room are some of my favorite works I've ever seen by him. I think there is a bit of William Blake in these magical works. Here is a reminder that the $25 tickets program continues at NYC Opera. Check the website for schedule and details. We're going to see Purcell's "King Arthur" (with costumes by Isaac Mizrahi), which is frankly somewhere in between a masque and an opera. 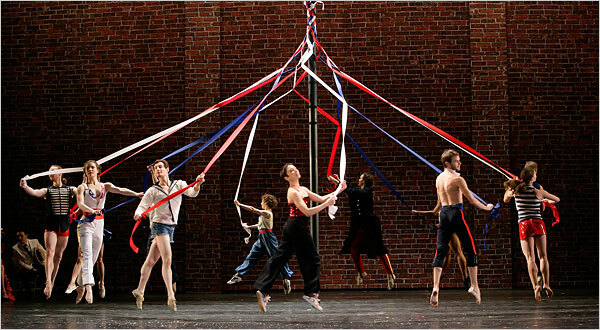 We fell in love with it after watching a DVD of a Salzburg production. Ignore the bitchy "I don't like my opera productions to be too innovative" comments on Amazon. James and I saw this video last week as part of the "Bare Market" exhibition and I keep thinking of it. The description from the press release is below. In Julika Rudelius two-channel video Economic Primacy, an all male cast of Dutch CEOs share their thoughts about power, money, and success. Interviewed using a hidden earpiece, they respond to Rudelius questions over the phone while she is situated in another room. Set in a generic office space of Rudelius own construction, the intensity of focus and sense of observation are penetrating. The blankness of the office tells of a certain lofty separation, perhaps out of touch, from the rest of society. 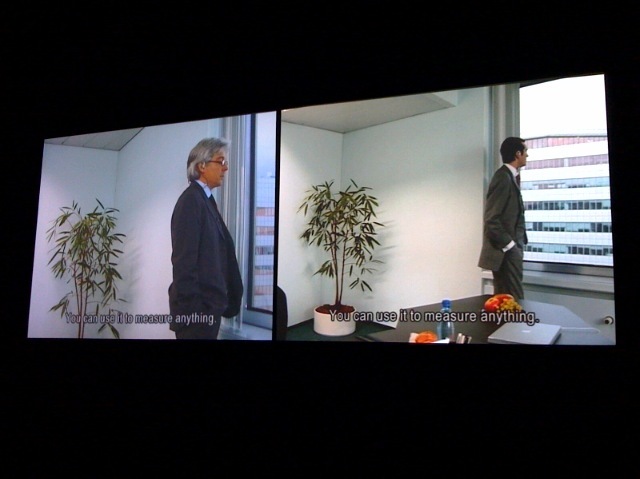 With this framing in double-screen, she heightens the candid nature of the conversations. Views on the role and importance of money as the ultimate measure of love, image, and success follow with snide quips on class and race. The man on the right in the installation shot talks about how good money is as an objective measure, even for love. He speaks of asking a woman how much money it would take to make her leave her boyfriend. Much of the discussions end up on the subject of the modern welfare state at some point, with these CEOs talking about people who don't work hard enough. One thing that shocked me was hearing the man in the top image mentioning what his monthly salary is. 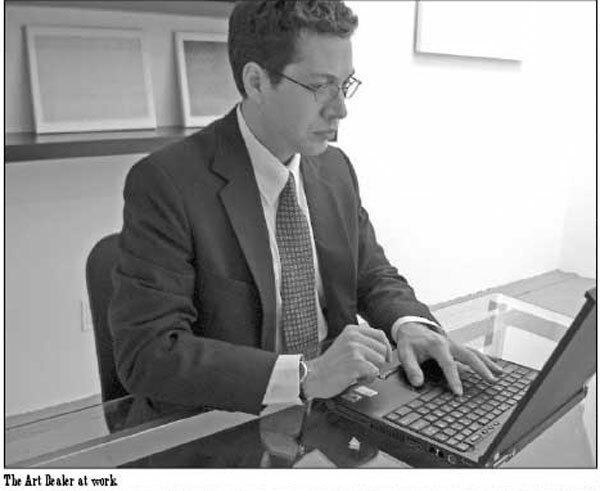 It's surprisingly low, and is more in the range of what a corporate lawyer with a few years of experience earns in New York. Our CEOs would laugh at the thought of such a salary. 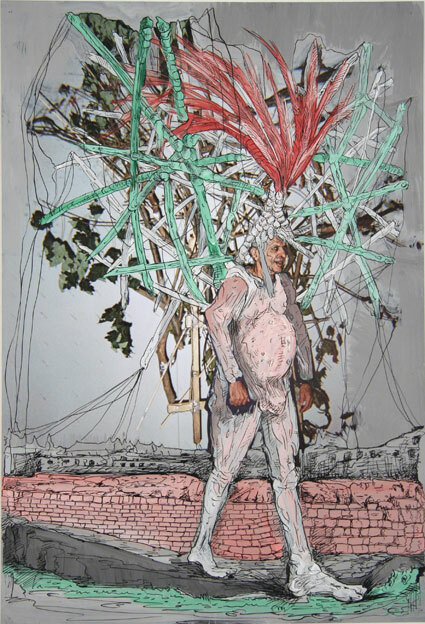 I just realized that I first saw the artist's work in an open studios event for the international studio & curatorial program (iscp) at Elizabeth Foundation. It was work from her series "Forever." See this Time Out NY review by Lauren Cornell for information on that project. All photos are courtesy of Thierry Goldberg Projects. The artist also has a website. I met the lovely couple that run Marx & Zavattero at Schroeder Romero's last opening, as they represent David Hevel as well. When they changed the gallery's name from Heather Marx Gallery to Marx & Zavattero, they promoted the name change with this combination mini level and tape measure. James took the photo for me. Look for my notes on the Whitney Biennial's press preview tomorrow or Friday. During her 20s, she explained, she lived illegally in an apartment in the district of Mitte, a now gentrified neighborhood in the heart of what was once communist East Berlin. 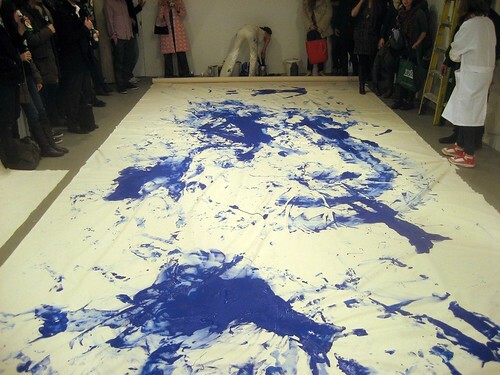 This is what the canvas looked like after Lilibeth Cuenca Rasmussen's re-enactment of "Anthropometries of the Blue Period" (1960) by Yves Klein. Go here to see my full flickr set. Unfortunately I ran out of space on my camera before she did Yoko Ono's "Cut Piece." I also added one more video at blip.tv.